Some readers may think that this material is incomplete and they are probably right. However, we are still in search of Uncatchable Joe aka AMD Athlon 64 X2, but still in vain. That's why in order not to hypercharge the situation, we offer sort of a first part of the article, devoted to multi-core solutions from the two main competitors on the x86 CPU market: Intel and AMD. This express-test reviews the performance of the new processor from Intel — Pentium eXtreme Edition 840 (note: the figure of four disappeared from the CPU title!) and compares it with two top single-core processors from Intel and AMD. Besides, we tested the Pentium 840 processor with disabled Hyper-Threading, though it's a synthetic situation. By the way, we can assume from the specifications of new Intel processors that XE 840 results with disabled Hyper-Threading must be identical to those of Pentium D 840, which price will be much more democratic. But we still refer to this processor as Pentium XE 840 w/o HT in the diagrams to be fair: we actually tested this modification, not the official Pentium D 840. I repeat, you shouldn't take this material as a complete all-sufficient article. It's rather a compromise between the necessity to publish available information ASAP on the one hand, and the lack of complete information on the other hand. Besides, note that the design of Pentium eXtreme Edition 840 has been recently (as always meticulously) reviewed by Dmitri Besedin, RightMark Memory Analyzer developer, in the corresponding article. As you may already know, Intel has taken the simplest tack in designing their first dual core processors. In fact it just combines two sterling CPUs and a bus arbiter in a single die, which allows to use the same bus to access memory and other peripheral devices. However, this arbiter is also a mandatory part of regular multi-processor systems based on Intel processors. There is always one bus, even if the system contains several physical CPUs. This approach is a distinguishing feature of multi-processor configurations based on x86 Intel processors: in case of AMD Opteron, each CPU has its own controller for memory and Hyper-Transport bus. Theoretically, the AMD concept is certainly more logical. But it's not clear whether it's of noticeable advantage to SMP systems based on a relatively small number of processors (for example, in systems with two CPUs). Anyway, AMD had to give up this advantage in its dual core processors — Athlon 64 X2 contains common controllers of memory and Hyper-Transport bus for both cores. We shall review Athlon 64 X2 later. And now we shall pay more attention to the hero of this review. You can easily notice that even core photos of Prescott successors are very much alike. 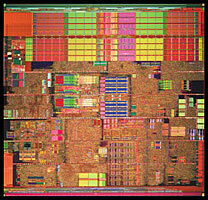 The photo of dual core Smithfield clearly shows two processors — two identical pieces on a die. The main problems of new Intel processors spring from the approach to their design: if the entire concept consists in placing two almost independent CPUs on a single die, you can hardly expect from this CPU a compact size, low heat dissipation, and low power consumption :). That's exactly what happened: Pentium eXtreme Edition 840 die has the surface area of 206 square mm, it contains 230 million transistors, and it consumes 130 W. Pay your attention: even Intel admits in its documentation that the CPU power consumption specified is not the maximum value: "...Intel recommends that complete thermal solutions designs target the Thermal Design Power (TDP) indicated in Table <...> instead of the maximum processor power consumption...". The positive point: the new Pentium XE 840 got the full set of the latest functions that come together with its core (doubled Prescott E0): EM64T support (counterpart of AMD64), Execute Disable Bit (XD), and Enhanced SpeedStep. The negative point: with all its impressive characteristics, the clock of a single core is rather low (for these days, of course): 3200 MHz. And that's eXtreme Edition, regular desktop dual core processors (which will be called Pentium D) will have just 2800 MHz (Pentium D 820). Thus, the Intel concept currently offers a choice between two mutually exclusive options: either clock (Pentium 4 eXtreme Edition 3.73 GHz, Pentium 4 570J, Pentium 4 660), or multiple cores (Pentium D 820-840, Pentium eXtreme Edition 840). The multi-core Pentium D currently differs from the Pentium XE with the same Processor Number only by disabled Hyper-Threading in Pentium D, so the system will detect it as two processors, while Pentium XE will be detected as four processors (2 physical cores + Hyper-Threading for each core). Dual core processors do not yet support the fastest FSB (its bandwidth is 1066 MHz), all of them, including Pentium eXtreme Edition, do with the old 800MHz bus. Judging from the above said, the following assumption seems logical: Pentium 4 eXtreme Edition 840 performance at best must be identical to the system based on two Xeon proccesors supporting Hyper-Threading, with a Prescott-like core, 800MHz FSB, 1MB L2 Cache, and 3.2GHz clock. That is Intel Xeon 3.2 GHz for Socket 604, for example, with sSpec Number SL7TD or SL7PF. There are no reasons to expect more from this processor. Unfortunately, we don't have an SMP system on these Xeon processors so far in our lab. So, today we can just look at the gain from the second core by comparing Pentium XE 840 with Pentium 4 540J. Did you notice that we used the most progressive and (presumably) the fastest chipsets, which is quite appropriate for the status of processors under review? They are all top solutions, so the slogan "A bas the economy!" looks quite justified in this case. Perhaps our readers are already tired of experiments, but we still hope to find an optimal compromise between the number of diagrams and tests and the readability of our articles. This time we offer you another modification of such a compromise: diagrams with all test results (64 items!) are published on a separate page — without comments, just as is. The article provides only summary diagrams that calculate the results of entire test groups into average scores. This approach appeases curiosity of the most inquisitive readers, who are against cutting down the number of test results published in our articles, and still makes the article less motley and graphics-intense. What concerns our comments, real professionals (who are interested in details) are expected to need none of them. As you can see, Hyper-Threading can have positive effect even in case of two sterling physical cores. If we consider Pentium XE 840 as a final product but not as an object of experiments, the normal situation implies HT support enabled. In this case we can state that the 840 processor outperforms Pentium 4 XE 3.73 GHz. The total leader in this test is Athlon 64 FX-55, but we still feel quite confident in recommending you have a look into detailed diagrams: you will see that the victory of A64 FX-55 is conditioned by excellent results in the Interactive test, while the final rendering is ruled by Intel processors. 3.2GHz single core Pentium 4 is outperformed in rendering nearly twofold, but in Interactive test its results are very much like those of Pentium XE 840. As a result, its total score is just 23% lower. Note that SPECapc for Maya resembles much the Interactive test from SPECapc for 3ds max, the second processor is usually not used in the interactive mode. So Pentium XE 840 expectedly doesn't demonstrate outstanding results in this test, its difference from Pentium 4 540J is minimal. Interactive tests in 3D modeling packages mostly imitate user's interaction with a given package, when a user changes, rotates, models something in the draft mode, etc. It's rendering engines mostly that are optimized to various SMP modifications. Note that there is no rendering subtest in SPECapc for Maya 6, so the issue of CPU rendering performance is "off-camera" in this case. The Prescott core did not demonstrate its best results in this application. 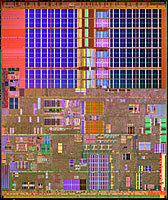 But you can see that the increased clock allowed P4 XE 3.73 to outperform Athlon 64 FX-55 at least formally (but you'll agree that 1 minute 25 seconds on a 40 minute timeline is a beggarly gap) Architecture aside, almost any rendering engine can be easily split into parallel threads, so the winner is known beforehand. Indeed, two cores, even if operating at a relatively low 3.2 GHz clock, outperform a single core operating at 3.73 GHz. The victory of 840 XE processor is so impressive that it's obviously not "on a decision" but a knockdown at the very least. It's not surprising that Pentium 4 540J is the slowest model in this test: it's inferior to Pentium 4 XE 3.73 GHz in terms of the clock and it does not have the second core. To all appearances, SolidWorks is either cannot be multithreaded at all, or it's badly optimized. It's actually very strange, considering the rank of this application: engineering CAD after all... If our assumptions about the lack of xMP (SMP, CMP, etc) support are true, the results are absolutely not surprising. The higher clocked Pentium 4 eXtreme Edition 3.73 GHz is certainly faster. And the FX-55 is even faster than that. However, the latter is not the hero of this review, so let's not pay too much attention to it. Size (HT has no effect here either). We cannot explain the strange effect of the 840 processor slowing down with disabled Hyper-Threading, so let's take it as is, as an accomplished and [currently] unaccountable fact. On the whole, you can see that the difference between the processors is minimal. The average score is not too good for the XE 840: it's the last but one among the participants. However, you should understand the reasons: this method of testing uses two archivers — 7-Zip and WinRAR, and the latter does not support multithreaded operations. Thus, the high scores of P4 XE 3.73 and Athlon 64 FX-55 in RAR resulted in this effect on the summary diagram. However, Pentium eXtreme Edition 840 is not heavily outperformed, which is very good considering its clock. It's actually an excellent result. Though at first it looks like Pentium XE 840 has failed — it hasn't outscored P4 XE 3.73 GHz, but let's not forget that they differ by 17% in clock frequency, because the cores in the 840 processor operate at 3.2 GHz. So it's actually a victory. The victory belongs not to this 840 eXtreme Edition processor, but to multiple cores as a concept. Encoding is not rendering, you can hardly expect the x2 effect from the second core here. If you have a look at the detailed results, you may see that the major contribution to the excellent total score of the 840 XE processor is made by Windows Media Video 9 and Canopus ProCoder 2. That's not bad, by the way: each sector (MPEG2 and MPEG4) has a representative. The advantage of Intel processors in CPU RightMark is not a secret, though this package is optimized for "general performance" (if we can say so) rather then for a certain architecture. It's also well known that CPU RM favours processors that are faster in the render module, because it's the slowest operation and it dictates the total performance. In this respect Pentium XE 840 offers excellent results: it outperforms the single-core counterpart almost by 80%. Theoretically, the second core can improve performance even in a single thread application — because it releases the core that executes this application from system services and background programs. But it's just a theory, in practice all games are surprisingly indifferent to SMP. However, we should check it up anyway, shouldn't we? No revelations here: this game expectedly demonstrates no multithreaded miracles, so Pentium 4 XE 3.73 GHz outperforms its multi-core brother, whose cores operate at lower frequencies. Results of Pentium XE 840 and Pentium 4 540J are only imperceptibly different. However, none of Intel processors demonstrates anything extraordinary, that's the demesne of AMD K8. The picture resembles the previous game, but the breakaway between the top single-core Intel processor and Athlon 64 FX-55 is smaller. The reason is actually clear: Far Cry is just a tad more critical to a video card than to a processor. This game (like all the other games we use in our tests) prefers AMD K8 processors and, to all appearances, it's indifferent to multi-core CPUs. No revelations here, everything is simple: AMD Athlon 64 FX-55 wins with a great breakaway, there is absolutely no effect from multiple cores, the highest-clocked processor leads among Intel models. It's crystal clear that a multi-core processor is not a good choice for games, you'd better choose a single core processor with a higher clock. The advantage of AMD platform in absolutely all our game tests is also obvious (and it's a significant advantage, by the way). Multiple cores provide no noticeable effect here, there is also no difference between performance with Hyper-Threading enabled or disabled. That's quite expectable: according to the statistics from the previous tests, professional visualization engines behave almost like games. Though we are generally careful about tests when one application runs on the background of another one, we still decided to carry out one such test in order to determine whether the second core makes a noticeable performance difference in this relatively rare situation. For this purpose we ran our standard test LAME / HQ together with Far Cry / HQ. In this case we were interested in how much the background process would slow down the main test. Increasing the number of background tasks (for example to four tasks) does not seem very interesting. It doesn't take much time to assume that three background processes will slow down the main task on the XE 840 based system like a single background process will slow down a single Intel CPU with Hyper-Threading support (or maybe a tad more). And the performance drop with three background processes running on a single core Intel processor will be maximum close to that on Athlon 64, but... Two active applications running simultaneously may be a real situation, but four applications are unreal (this may hold true for optimistic people, who are fond of exotic computer usage). Remember that we review desktop processors here. Not server processors. Judging from the behavior of applications that are traditionally sensitive to sterling SMP, we can assume that multiple cores (at least their Intel version) are not very different from the above mentioned sterling SMP, that is two independent processors. Or there is no difference at all. It's good. Programs that are indifferent to SMP or Hyper-Threading and that cannot use them have absolutely the same reaction to multiple cores. That's why if you don't run several heavy applications simultaneously on your computer and your software is not multiprocessing, there will be no effect from a multi-core processor. If we also take into account that the core clock in such processors is considerably lower than in single-core processors, the conclusion suggests itself. The strongest reaction to multiprocessing variations is demonstrated by 3D and bitmap graphics packages and multimedia codecs. This class of applications is not very wide spread, but it's not limited or unpopular either. Strange as it may seem, Hyper-Threading support in case of two physical cores sometimes provides some performance gain. However, the number of such cases has grown even fewer than in case of Hyper-Threading support on a single core. On the whole, the gain from multiple cores is rarely indeterminate: as a rule, it's either significant gain or no gain at all. So it's surprisingly easy to decide whether you need a multi-core processor: just make a list of programs, which performance is especially unsatisfactory, and then take a look at the test results in these programs (or perform such tests on your own, if you found nothing over Internet). Everything will become crystal clear. Our preliminary conclusion (because the multi-core processor from AMD is not yet tested) produces an impression that the mass market is not yet ready to accept multi-core processors seriously. Those who buy processors to enhance their prestige will hardly rise to the bait of Intel dual cores: these processors currently offer low clocks and they are slower in non-optimized software than top single-core processors. They are so slower, that you will even feel it, to say nothing of seeing the difference on diagrams. What concerns regular users of mainstream solutions, they will find the price excessive even in case of the cheapest dual core processor (besides, inexpensive models have even lower clocks). So, dual core CPUs will most likely be bought by users, who clearly understand what exactly they need. And such people usually have a strictly utilitarian attitude to processors (as well as to computers in general), so there is little feedback from them and there are few users who actually need SMP(CMP) systems. What concerns Pentium eXtreme Edition 840, it didn't demonstrate anything unexpected (if you knew its specifications). Both in good and bad senses of this word. In fact, it's two sterling CPUs put into a single package. Thus, it would have been naive to assume that this solution would grant processors some cardinally new properties. That's what really happened: if we disregard technical details of the given design, we can see a functional counterpart of an SMP system based on two Xeon 3.2 GHz in a single package. Nothing more. But nothing less either: judging from indirect data, the merger caused no performance losses in SMP-optimized applications. However, it is quite expectable: it's easier for Intel, because its processors sit on the same bus even in sterling SMP systems. However, in case of SMP-unoptimized software and a single active application, Pentium XE 840 is a regular Pentium 4 540J as far as performance is concerned. So our conclusion is as follows: Intel designed exactly what it wanted (within the confines of the selected dual core concept) and what it was capable of (in terms of clocks). Of course, we can reason "...if ifs and ans were pots and pans...", and grumble that MHz and processors used to be faster and that the hardware designers should have started with 4Ghz and reduced the power consumption twofold... But this reasoning is of little use for regular consumers. When our lab gets a dual core processor from AMD, then we shall see who did a better job. But then again it will be done from the purely consumer point of view. It's because brilliant ideas and harmonious concepts have never added a single fps.